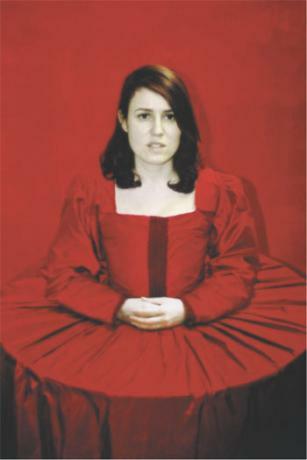 The Bachelor Tree is Michelle Griffiths exploration of durational performance, furniture and dress. She combines a challenging juxtaposition of references in her work from Victorian paintings to David Lynch films and Pre-Raphaelite photography, and in this instance Duchamp’s "The Bride Stripped Bare By Her Bachelors, Even", Michelle chooses to make work incorporating herself in the display, illustrating that life can be overwhelming as well as surreal for all people at some time in their lives. Michelle studied painting at Wimbledon School of Art and The Royal College of Art and has since exhibited in galleries and alternative spaces in London, Oslo, Vienna, and Turku (Finland). She is best known for her durational performance/installation submerged in a tank of water at Brian Eno and Laurie Anderson’s “Self Storage” in Wembley, and her performance tied to the jackstaff of HMS Plymouth in Birkenhead as part of Gary Perkins’ “Kling Klang”.